Intel’s Ultra low power Atom processors have been gaining much attention among board vendors after its official launch. While AMD doesn’t seem to be doing well recently, there is a plan to release an Atom’s rival in both mobile and embedded markets. Named as AMD Sempron BGA, it is expected to fight head to head with Intel Atom processors in these competitive market space. AMD Sempron BGA, or better known as Bobcat is based on AMD’s Sempron core, that is underclocked to just 1.0GHz or 1.5GHz in order to reduce total power consumption to make it fit well into low thermal envelope requirement . However, as compared to Intel’s Atom that could run at 1.1GHz or 1.6GHz, the TDP (Thermal Design Power) value of 8 watt is still quite high to be designed into any embedded and fanless application. Nevertheless, its usage models could be targeted well into nettop or netbook that may require less stringent power management system. While this is still in very early stage, there is already some engagement with external board manufacturers like Ibase, an Taiwanese company to come out with a 3.5-inch ultra small SBC form factor board, IB885. 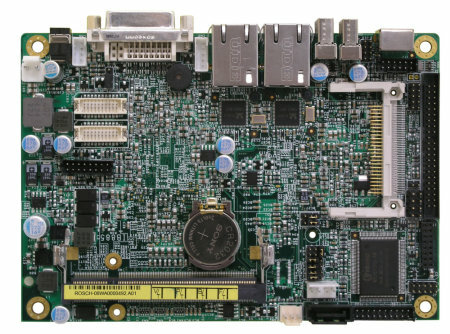 The board features an on board Sempron BGA that coupled with M690E northbridge and SB600 southbridge to provide a 3-chips solution with integrated graphics, 1GB DDR2 memory, an 800MHz HyperTransport Link as well as some expansion interfaces such as USB host, Gigabit Ethernet ports and Compact Flash slot for external storage. No word on pricing yet, the IB885 is expected to be available in limited quantities to board vendors for evaluation by end of October.